The easiest way to make sure your hamster’s diet provides everything he needs is to buy the best prepared food you can find. Then supplement its diet with pieces of fresh fruits and veggies, throwing in an occasional mealworm or cricket. 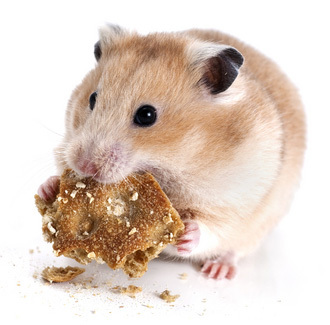 A varied diet is as important to hamsters as it is to people. Pellets are a food where the ingredients are ground up, mixed, and formed into little pieces. The requirement to gnaw on pellets and the balanced nutrition of pellets make them a suitable part of your pet’s diet. Mixed seeds & grain are just like they sound, a food mixture of seeds and grains. Some mixed foods include a variety of dried fruits, nuts, and seeds. This type of food provides a variety of choices for your hamster to enjoy and is an excellent part of his diet. Timothy hay, alfalfa or a mix of the two are a nice addition to the diet. In the wild, hamsters are grass eaters and may enjoy nibbling on some hay. Not all will eat it, but it is worth a try. To add some variety and added nutrition there are many fresh foods your companion may like. Try acorns, apples, bananas, green beans, broccoli, cabbage, carrots, cauliflower, celery, corn, zucchini, cucumbers, grapes, kale, oranges, peas, spinach, sweet potatoes, and turnips. The key with fresh food is to supply it in small portions since hamsters store away excess food. Rotten food is not something you want in your pet’s cage. There is an amazing variety of hamster snacks and treats that you can offer a couple times per week. These treats, although very enjoyable to your hamster, are not a well balanced diet so use them sparingly. Most treats are sweetened foods like seeds, nuts, and dried fruits and vegetables that your pet will love. Alternatives to store bought treats are scrambled or hard boiled eggs, dog biscuits, sugar-free cereal, whole wheat bread, and uncooked pasta. You can even feed him mealworms or crickets. Commercial hamster food is supposed to have all the nutritional requirements necessary for a healthy pet, but supplements are a good way to guarantee a well balanced diet. Dietary supplements are available with vitamins, minerals, and calcium that come in flavors a hamster will enjoy.